"This is a handy sauce to keep in the fridge for Asian dishes. Store in the refrigerator for up to 3 weeks." Combine chicken broth, cornstarch, soy sauce, corn syrup, sherry, cider vinegar, garlic, ginger, and cayenne pepper in a 1 1/2-quart jar with a tight-fitting lid. Shake well. 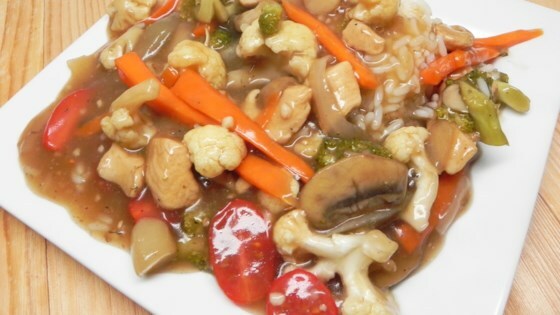 To use this sauce, just stir-fry vegetables and meat (optional), then pour in some sauce. Stir as it thickens and add a bit of water if it is too thick. It's just that easy!